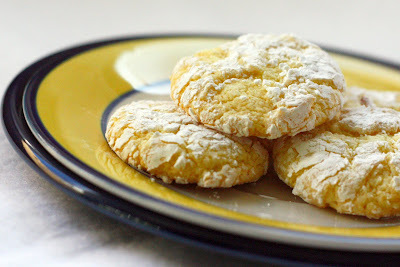 I initially found this recipe 4 or 5 years ago when I had given my dad a membership to a "cookie of the month club." (Of course, they were all baked with love by his daughters!) 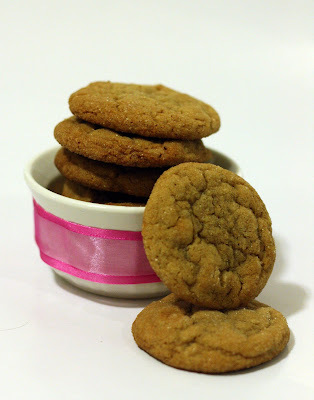 I'm usually not much of a ginger snap girl, but the texture of these soft cookies soon changed my mind! They have a wonderful, rich flavor, and never last long in my house. They are great with a cup of coffee! Mix together the flour, ginger, baking soda, cinnamon, and salt. Set aside. In a large bowl, cream together the butter and 1 cup sugar until light and fluffy. Beat in the egg, then stir in the water and molasses. Gradually stir the dry ingredients into the molasses mixture. Shape dough into 1 inch balls, and roll them in the remaining white sugar. Place the cookies 2 inches apart onto an ungreased cookie sheet, and flatten slightly. Bake for 8 to 10 minutes in the preheated oven. Remove from cookie sheet in 1-2 minutes. Store in an airtight container. 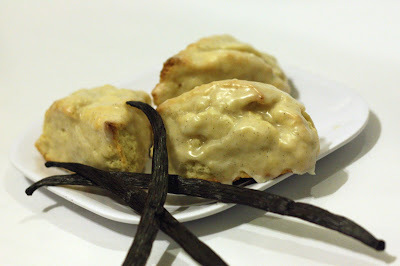 After making some homemade vanilla for my mother-in-law for a Christmas present, I've had some wonderful vanilla beans calling my name from my cupboard. These scones were a great opportunity to use them! The tiny flecks look great in the icing, and they were quick to make and held up well to eat the next morning on the road to skiing. In a medium mixing bowl, mix together the flour, baking powder, salt and sugar. Cut the butter into tablespoon-sized pieces and cut it into the dry ingredients. In a large bowl, whisk together the eggs, cream, vanilla extract, and vanilla bean seeds. Whisk the dry ingredients into the wet ingredients. Knead the dough, either in the bowl or in on the counter, just until mixed well. Separate the dough into thirds. Shape each portion of the dough into a circle (approximately 1 inch thick) and then cut each third into sixths. Place scones 1-2 inches apart on a cookie sheet. Place the pan of scones in the freezer, uncovered, for about 30 minutes. Then, remove the scones from the freezer and put them directly into an oven preheated to 425 degreees.. Bake for 10-12 minutes or until just starting to turn golden brown. (If you cook any longer, the bottoms may burn). Immediately remove from cookie sheet & place on a cooling rack (placed over parchment or waxed paper). While still warm, spoon vanilla bean glaze over scones, trying to cover all surfaces. Mix all ingredients. Add enough milk/cream to make the glaze the consistency you desire. We all love a good meal, especially when it's easy to make and fairly healthy. We served it over rice with sour cream, but it would be very good as meat for fajitas or tacos, too. 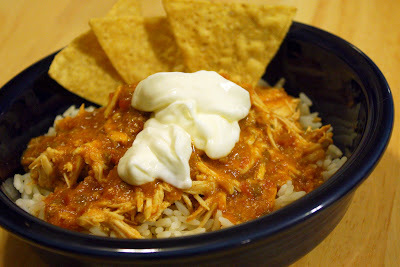 Put chicken into crockpot, and sprinkle with taco seasoning. Mix cream of chicken soup with salsa, and pour on top of chicken. Cook on low for 6-8 hours. Chicken will shred very easily when done. 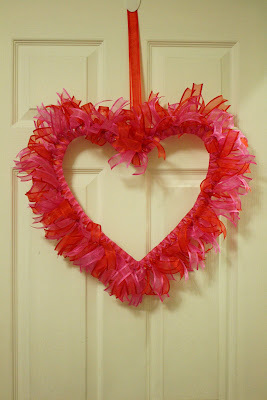 After taking down my Christmas wreath from our door, I thought I should make a Valentine's Wreath. As always, I was trying to stick to a budget, and managed to make the wreath below for $3. Yes, that's right, only $3. (Actually, less if you consider that I didn't use the entire piece of foam board and have left-over ribbon on the spools.) 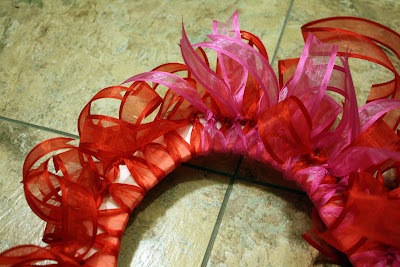 I bought pink & red organza ribbon - 25 yard spools for only $1 each, and the foam board was from Dollar Tree. If you want a little more control over the ribbon, you could buy wired ribbon. 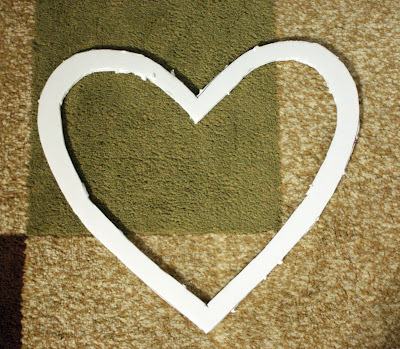 Cut out heart shape from foam board. I first cut it a half-heart out of paper, then traced it onto the foam board. Make the width approximately 1 inch. Cut ribbon into 12 inch pieces. 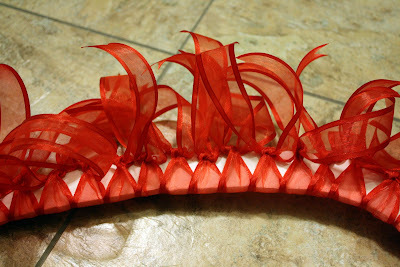 I wrapped the ribbon around a ruler multiple times, then cut at each end as a quick way to cut the ribbons. Trip the ends into a V shape if you desire. Tie your first color of ribbon around the frame, just barely overlapping. Tie your second color of ribbon inbetween the other ribbons, so the entire frame is covered. One of our friends brought these tasty cookies to our holiday party in December...and Josh ate them! Finally, a sweet that Josh ate more than one of! The recipe is incredibly easy - you may already have everything you need in your cupboard & freezer. They have a wonderful light, chewy texture, and look quite pretty on a plate. They are a little sticky to make, but getting your hands dirty can be half the fun! I'm sure kids would have a great time helping mom in the kitchen with these cookies. Mix the first three ingredients. The mixture will be very sticky. Drop heaping teaspoons into powdered sugar & roll to fully coat. I found it easiest to drop 4-6 cookies into the powdered sugar, then roll them and place them on the cookie sheet. Place on an ungreased cookie sheet (I used silicone baking sheets), 1-2 inches apart. Bake for 8-10 minutes at 350 degrees. The cookies will just be starting to turn brown at the edges. Remove from cookie sheet 1-2 minutes after removing from the oven. **I used a french vanilla cake mix, a box of lemon pudding & 1 tsp lemon extract. Because of the slightly extra amount of dry ingredients, I used approximately 3/4 of an 8oz tub of cool whip. I LOVE crab rangoons. Ever since I had my first taste of Chinese food, I would gladly make a meal out of crab rangoons at a Chinese restaurant. I've always wanted to try making them, but don't have a deep fryer, and know I wouldn't use one frequently enough to justify the purchase. I ran into this healthier version, and made them for our holiday party last month. They were a hit & so easy to make! Lightly spray mini muffin tin. 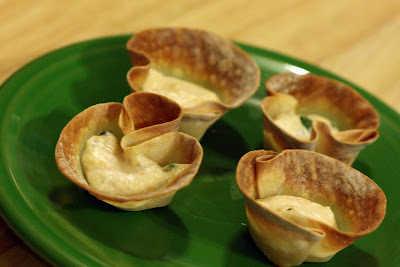 Place wonton wrappers into the tins, carefully shaping into a cup shape. Lightly spritz each wrapper with spray, and bake for approximately 6 minutes. Take cups out of the oven & place a spoonful of the crab mixture into each cup. Cook for an additional 6-10 minutes, until edges are golden brown & filling is warm. I used the cheapest crabmeat I could, which I believe was a pink crabmeat. It was already flaked/shredded, so all I had to do was drain the liquid from the meat. Wonton wrappers are in the produce area - they make both round & square ones. I used the round as there were more in the package for the same price. If you double the above recipe, you should use just about all of the wonton wrappers. (About 60 crab rangoons). I added just a bit of garlic powder for an additional bit of flavor, but it was barely noticable. We didn't make all of the rangoons the night of our party - the filling will keep in the fridge for 2-3 days. Just my luck, just when I start a blog, my computer shows me the blue screen of death - repeatedly. Thankfully, my wonderful husband took care of the issue today & I can finally post my first recipe of the year! I have an adorable mini bundt cake pan that I love to use, and I wanted to make something to share with the nurses in the NICU. I found a recipe for a delicious pound cake recipe online, and with a few tweaks in the ingredients, I was able to make it without going to the grocery store. The cakes were gone in a flash - so moist & tender, with a very fine crumb. The cake itself is very sweet, so the icing is quite sour to offset the sweetness. Mix flour, salt & baking soda in a bowl, set aside. In a large bowl, beat the butter and cream cheese on medium speed until creamy and smooth. Gradually add the granulated sugar and continue beating until light and fluffy, about 5 minutes. Make sure to scrape down the sides occasionally. Increase the speed to medium-high and add the eggs one at a time, beating well after each addition, then beat in the vanilla. Reduce the speed to low and add the flour mixture in three additions. Beat each addition until just incorporated, stopping the mixer occasionally to scrape down the sides of the bowl. Spoon the batter into the prepared pan, spreading the batter so the sides are higher than the center. Bake until the cake is golden and a toothpick inserted into the center comes out clean, about 1 1/2 hours. Transfer the pan to a wire rack and let the cake cool upright in the pan for 15 minutes. Remove from pan carefully to finish cooling. Mix all ingredients together. Adjust powdered sugar until desired consistency. Spread over cooled cake. 1) My sister & I had the wonderful idea of making cookbooks for our family members for Christmas that would include most of our traditional goodies. I thoroughly enjoyed baking & photographing each treat, and giving the books out to our loved ones. I've been photographing my other foods since that time, but did not have a way to share them. 2) My mother-in-law bought me the most wonderful cake cookbook for a Christmas gift, and I wanted another reason to bake each & every cake in the book. Cakes & cupcakes are my specialty. Until the past few years, I primarily enjoyed decorating cakes. Now, I also love experimenting with other flavors, fillings & frostings. I can't wait to try a new recipe, if only I can decide which will be first. 3) I wanted a new project for the new year. This past year involved many DIY projects including putting the finishing touches on our wedding plans, as well as projects around our apartment - painting, refinishing dressers, decorating our first home as a couple, putting down new floors, etc. But, as we do not own, I've completed all of the large projects to be done and need something new to put my creative efforts towards.